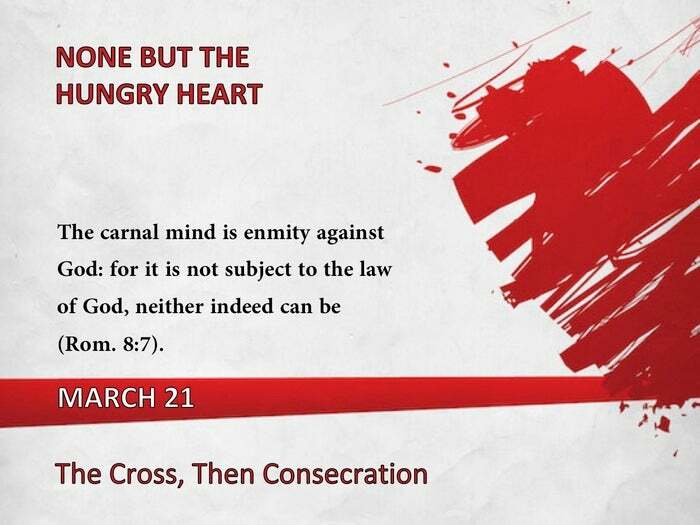 The carnal mind is enmity against God: for it is not subject to the law of God, neither indeed can be" (Rom. 8:7). The Cross is the altar upon which God sacrificed His Son. It is upon this same Cross (take up your Cross "daily"), this same altar (the place of death), that I am to be consecrated to God as "a new creation" (2 Cor. 5:17). This eventuates in my intelligently yielding myself to Him as one who is "alive from the dead" (Rom. 6:13). "God asks us to present our bodies as living sacrifices to Him (Rom. 12:1). Until we have done this, there is nothing else we can do. But notice that this exhortation comes after Romans Six. There is a reason for this order - crucifixion comes before consecration. Uncrucified self refuses to be consecrated (to say nothing of God's refusing to accept it). That is why so many people with all sincerity walk down the aisles again and again, consecrating uncrucified self to God." -H.D. "We must learn to know Him and to love Him. Then we will not have to struggle to move into consecration. The heart will lead into it. A lover never thinks about giving himself to a loved one. He cannot do otherwise. He loves to do it. Is there not here a key to consecration? Why do we not yield? Because we do not love. Why do we have to fight the battle and vow and groan and struggle? Because we do not know Him." -C.A.C. "That I may know Him...and the fellowship of His sufferings" (Phil. 3:10).